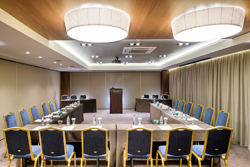 A five star hotel of ultimate hospitality for distinctive guests, located next to one of the most picturesque areas of Thessaloniki, called Ladadika and with a magnificent view to the sea of Thermaikos Bay. 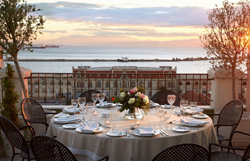 The Mediterranean Palace Hotel displays the most beautiful characteristics of Thessaloniki the live cosmopolitan atmosphere and the traditional warm hospitality. The hotel’s style and luxury combined with its privileged location, in the heart of the city, makes an ideal destination for business and holiday travelers. 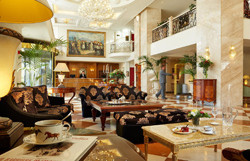 111 rooms, 1 Presidential Suite, 1 Executive Suite and 5 Junior Suites appreciating both city and sea views, are carefully designed to provide the highest comfort and luxury standards. 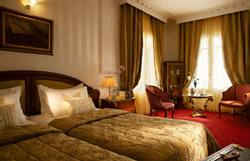 Each guestroom is appointed with amenities and facilities. Individual air condition and heating, mini bar, satellite TV, room safe, direct phone line, High Speed Wi-fi Internet connection, telephone in bathroom, 220V power supply, hair-dryer, bathrobe, slippers and working desk for the business travelers. Exquisite gourmet suggestions with remarkable plates by the Diplomatico Restaurant. A place of meeting and culinary delight at any hour of the day, for a business lunch or a relaxed dinner, which becomes an art that uplifts the senses. “The Hours Bars” for cocktails and enjoyable taste journeys. A pleasant room for friendly or professional meetings, where special coffee varieties, light snacks, and fine wines are served. Bonzai Lagoon & Spa wellness center a discrete environment with Sauna, Jacuzzi, a small indoor heated pool and face & body massage services are available for our guests, ideally for relaxation and revitalization. 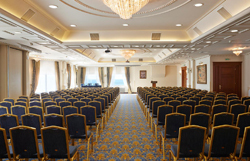 Other facilities and services included are: concierge, laundry and valet services, parking, multilingual stuff, 24-hour Room Service, car rental, Limo Service, Rooms and Facilities for physically disabled guests, non-smoking rooms, Shuttle Bus Service. 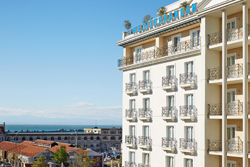 The Mediterranean Palace, member of Thessaloniki Convention Bureau, was for the second year in a row, awarded as the Best Greek Business City Hotel at the Greek Hospitality Awards 2018. 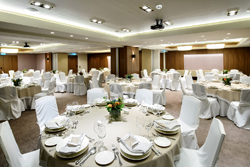 Its 7 multi-function meeting rooms with modern technical equipment, are available to host different kind of corporate and social events, of 10 to 350 persons. 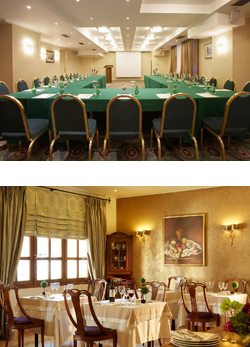 Ôhe comfortable and friendly environment, modern technical equipment audio-visual equipment, high speed internet connections (Wi-Fi & Wired Internet), secretarial services, notepads and pens for all participants, musical coverage, venue decoration, menu suggestions, porterage services, parking services and assisting areas, as well as the hotel staff that takes care of every detail of the meeting, guarantee a successful event. Settings include Zeus, Poseidon, Apollon, Ifigenia, Nafsika.